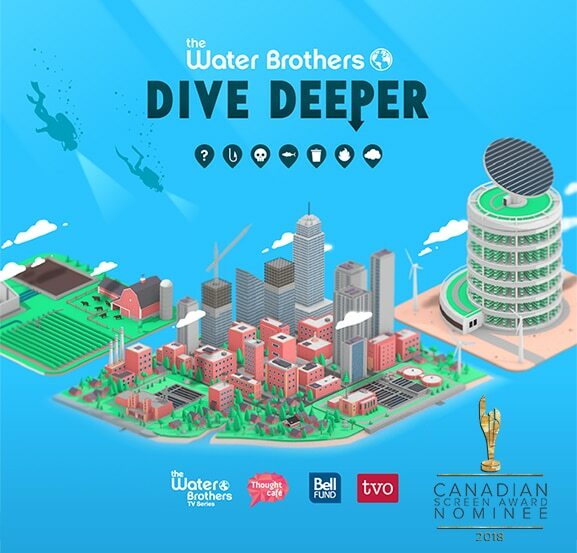 Toronto, ON – January 19, 2018 – SK Films is very pleased to announce that its eco-adventure television series The Water Brothers and its interactive digital companion series, Dive Deeper, have been nominated for three 2018 Canadian Screen Awards. The Academy of Canadian Cinema and Television announced the nominees at an event held at the Globe & Mail Centre in Toronto. The Water Brothers is nominated for the inaugural ‘Rob Stewart Award for Best Science or Nature Program or Series’ and for ‘Best Sound, Non-Fiction’, while Dive Deeper received a nod in the category ‘Best Cross-Platform Project – Non-Fiction’. The Academy honours outstanding achievements in Canadian film, television and digital media and is considered the highest level of recognition in the Canadian film industry. Alex and Tyler Mifflin, the series’ passionate creators, hosts, and directors, were delighted when they heard the news. “Thanks to the Academy for this wonderful nomination. Rob Stewart was an incredibly talented filmmaker and someone we always looked up to. We were honoured to have known him and we hope to carry on his legacy of using media to influence positive change for the ocean.” Alex said. “We’re so excited to be recognized by our talented peers in the Canadian industry!” Tyler added, “Putting the series together is a serious team effort, and we can’t thank our colleagues and collaborators enough.” In particular, they wanted to share this honour with Executive Producer Jonathan Barker, Producer Wendy MacKeigan, TVO broadcast executives Jane Jankovich and Christine Lee, Editor Steve Guise, Production Manager Nathan Cohen, the team from Eggplant Picture & Sound and animation studio Thought Café (Jon Corbiere, Tyler Sammy and Nick Counter as well as the rest of their dedicated crew) for their superb work in designing and continuing to enhance the interactive experience of Dive Deeper. The Water Brothers follows Alex and Tyler as they explore the world, uncovering the planet’s most important and leading-edge water stories and interviewing top scientists and experts on solutions to help overcome the many and diverse environmental challenges we all face. There is nowhere they won’t go from high mountain peaks to the bottom of the ocean. In their 4th season, Alex and Tyler explored the Amazon rainforest to learn about the vital role of trees in the water cycle (Flying Rivers), investigated rampant seafood fraud in the sushi industry (The End Of Sushi), learned how drones, satellites and ROV’s are helping to combat the global crisis of illegal fishing (Ocean Spies) and how climate change is already impacting Canada’s freshwater ecosystems, and what these changes means for our future (On Thin Ice). Dive Deeper is a series of interactive web stories that allow users to navigate through engrossing animated sequences, stopping along the way to discover fascinating facts and watch short videos to learn about global environmental challenges; why they matter, and most importantly, what users can do to help make a difference and be part of the solution. The Water Brothers airs in Canada on TVO, Knowledge Network, and Radio – Canada in Quebec, as well as in over 50 countries worldwide. Dive Deeper is available online at www.thewaterbrothers.ca/divedeeper. Special thanks to the Bell Fund and the Canada Media Fund for their ongoing support. SK Films is an award-winning content provider and a global leader in the IMAX®/Giant Screen industry. SK works across various genres and platforms, including theatrical, television and digital media, with a special emphasis on creating high impact natural history and science related content. SK has a reputation as one of the most accomplished and respected producers and distributors supplying 3D, 2D and Dome product to IMAX and other Giant Screen theatres worldwide, with a mission to entertain and inspire audiences and immerse them in the awe and wonder of the world we live in. 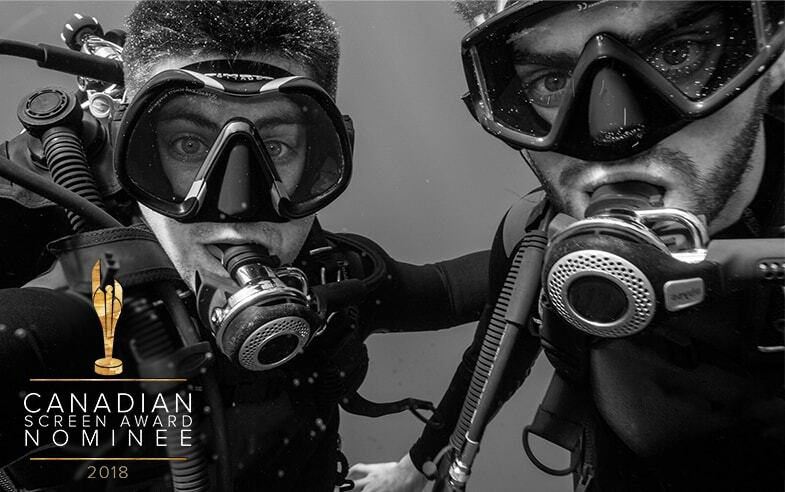 The Water Brothers Dive In to Season Three of their Eco-Adventure Series!